In many comic books a villain or enemy of sorts is often created that has to rival the hero's might. This is supposed to create a story which leaves the reader uncertain if the hero can overcome their opposition. I am not a huge fan of this in comic books. If Wolverine, for example, is the best there is at what he does then nobody should be able to best him in a fight (nobody of similar strength and skills). I like my hero to be the best in his or her field. I'm in favor of truths like Superman is the strongest character in the DC universe because truths like that set up one great story where a creature comes along and beats Superman to death. How great was the "Death of Superman" story? It was great because throughout Superman's comics he was tested but never bested. I enjoy the Invincible Iron Man #32 because Iron Man is clearly the advanced piece of weaponry in the issue. 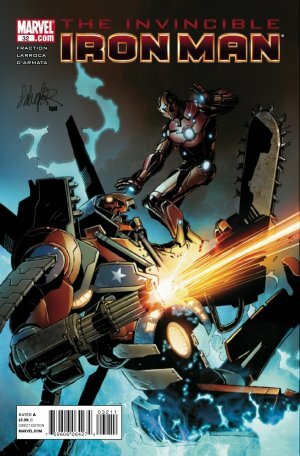 A new comer by the name of Detroit Steel can't even put Tony Stark's Iron Man down and Steel has a crap load of mini smart-phone ap controlled robot planes attacking Iron Man at the same time. Iron Man even makes fun of Detroit Steel's chainsaw arm and how remedial it is. Chainsaw arms are so the 70's and like the city of Detroit, Steel just can't compete. In the comic of the day, Iron Man remains the elite armored tech-wielding hero.